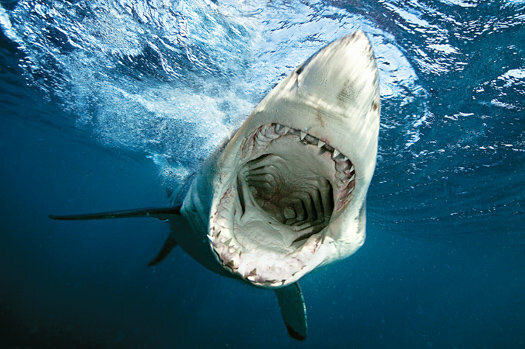 When Animals Attack Australian researchers use satellite-linked buoys and seafloor sensors to track RFID-tagged great white sharks. Stephen Frink/Getty images. Great white sharks have been around for more than four million years, yet they remain one of the world’s most mysterious animals. Scientists know that the beasts have special organs for sensing electromagnetic fields and that their jaws can snap down with 4,000 pounds of force. But migration patterns, which are critical for conservation efforts, are mostly unknown. That will change now that marine biologists in Australia can follow the whereabouts of 75 of the man-eaters using radio-transmitter tags and a network of 20 satellite-linked buoys. It’s not known how far great whites—whose worldwide numbers are estimated to be fewer than 3,500—migrate or if there’s a season when they spend more time near the coast, says Rory McAuley, a senior research scientist with Western Australia’s Department of Fisheries. McAuley hopes that the buoys, along with about 50 sensors on the ocean floor, will also reveal behavior. This information could help authorities better predict the monthly risk at beaches and restrict seasonal shipping routes to protect sharks from boats.